As the director of a leading edge graduate program in digital media and engagement, as well as a content creator, I do receive a fair amount of invitations to participate, collaborate and give. Over the past few years, I’ve become a lot more parsimonious about accepting them, preferring to devote my limited time to students and family. So I’m usually a “no” first before I say “yes” — if ever! A couple of years ago, the leadership at Arcade magazine — a publication about design and the built environment — asked this communications strategist and educator to be the feature editor for the kickoff issue of its redesign. I said “no” at least twice, wondering what the connection was to my world, until I opened my mind and (a) saw the intellectual link between engagement and architecture; (b) recognized that this publication would help “extend my reach” and connect with communities with whom I don’t normally have a relationship. In 2010, I interviewed UW history professor Margaret O’Mara (watch it above) “whose work looks at the growth of the knowledge economy and the reasons creativity and innovation thrive in particular places.” Margaret also serves as the research consultant for the new Center for Innovation. Are you beginning to see how this chain of “yes’s” connects? Thanks to Margaret, I ultimately ended up joining forces with Olson’s Alan Maskin and Marlene Chen to produce some of the content that will go into MOHAI’s new permanent exhibit this fall. And because of this partnership, I recently got to sit down with the funder of this initiative, and the founder of Amazon.com, Jeff Bezos. 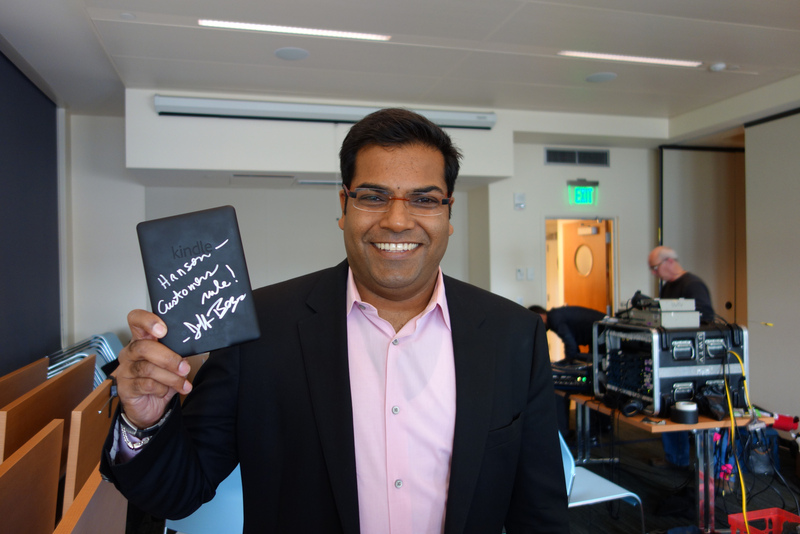 Which is how — bringing this post full circle — he agreed to sign the back of my Kindle (he said “yes” without hesitating). The moral to this story? Try to say “yes” more than “no.” “Give” more than “take.” Indeed, a friend recently gave me the terrific new book by a Wharton business professor, “Give and Take: A Revolutionary Approach to Success” in gratitude for my taking the time to share some career advice. I was deep into reading this book about generosity of spirit that leads to career success, when Arcade asked whether I would engage my social networks to participate in today’s “Give Big” campaign — whereby the Seattle Foundation matches all donations to non-profits such as Arcade for the next 24 hours. Instead of ignoring this request, I said “yes.” So I donate this blog post (and I’ll also be donating money) to Arcade Magazine to support dialog on design. Won’t you join me? GiveBig! Next:Can this instrument teach, illuminate and inspire? TV is dead, long live content!